MILWAUKEE — When their home record sat at 4-14 in mid-May, third baseman Casey McGehee told reporters the Brewers would get back to .500, even if it took until September. It came down to the 80th game of the season at Miller Park, but they ultimately came up short. With a 4-0 loss to the Marlins on Saturday, the Brewers guaranteed a second consecutive losing record at home, dropping to 39-41 on the season in Milwaukee. “I think my point in saying that before was that we weren’t just going to roll over on it, and just say, ‘Oh, well we struggle at home,'” McGehee said. “We were going to keep battling. From where we started to where we are now, we made up some pretty good ground as far as our record here I think. With all the offense they put up over the last three days, the Brewers probably would have liked to have saved a couple runs for Saturday night. After scoring 27 runs over the course of three straight wins, the Brewers couldn’t figure out Marlins right-hander Chris Volstad. Any remaining doubts as to what side of .500 the Brewers would finish on overall were put to rest Saturday as well. With the loss, they dropped to 72-82 overall, guaranteeing they would finish with their second consecutive losing record. The biggest reason behind the Brewers’ poor home and overall records could be attributed to their inconsistency, especially offensively. Fittingly, this week has provided an excellent example of such inconsistency. Despite being among the league’s top run-scoring clubs — as evidenced in their 13-1 win over the Reds on Wednesday — the Brewers are among the leaders in being shut out as well. Saturday marked the 14th time this season Milwaukee was held scoreless. Volstad (11-9) tossed 6 2/3 scoreless innings, scattering six hits while striking out two batters with no walks. Of those six hits off Volstad, none were for extra bases, which limited the Brewers’ ability to put together any sort of big inning. Volstad’s success came on the heels of a five-hit shutout in his previous outing, a 4-0 Marlins victory over the Cardinals. The Brewers’ biggest opportunity came in the eighth inning, when they loaded the bases with two out on three singles in a four-batter span. Reliever Jose Veras entered to face catcher George Kottaras, who ripped a liner to center field. Unfortunately for the Brewers, it was hit right at center fielder Cameron Maybin, who secured the final out of the inning. Left-handed starter Chris Narveson delivered his fourth quality start in five chances this month, tossing 6 2/3 innings while giving up two runs on six hits with one walk and five strikeouts. For Narveson, three hits — two first-inning singles and a seventh-inning homer — ruined what was otherwise an impressive outing. Narveson dropped to 11-9 on the season, despite posting his 11th quality start. Over his past 12 starts, Narveson has posted a 4-3 record with a 4.12 ERA, allowing 34 earned runs in 74 2/3 innings of work. In 14 previous starts, Narveson was 6-6 with a 5.87 ERA, giving up 50 earned runs over 76 2/3 innings pitched. The biggest change, as his manager sees it, has been Narveson’s ability to realize what he needs to do to be effective. “I think he’s kind of learned what type of pitcher he has to be, what works best for him,” said Brewers manager Ken Macha. “He does the fastball-changeup thing and mixes in a couple curves. MILWAUKEE — When the night began, Tuesday’s game meant far more to the Cardinals than the Brewers. That all changed when Trevor Hoffman entered in the ninth. With a two-run lead, the Brewers called Hoffman’s number, setting him up for career save No. 600. 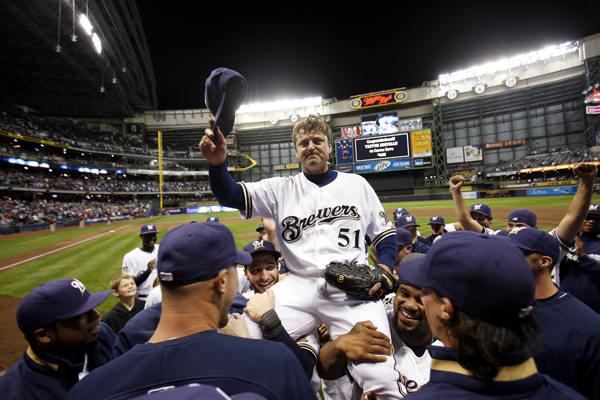 Hoffman delivered as he pitched a scoreless ninth in the Brewers’ 4-2 victory over the Cardinals at Miller Park. Before Hoffman’s historic 600th save, the game was highlighted by a number of unusual happenings on the field. Brewers manager Ken Macha was tossed by second-base umpire Tim Timmons, and Brewers center fielder Chris Dickerson, Cardinals pitching coach Dave Duncan and then a male fan sitting in the stands near home plate were all ejected by home-plate umpire Bob Davidson. The flurry of ejections began in the bottom of the second inning, when Timmons called interference on Brewers runner Craig Counsell for leaving the baseline in an attempt to break up Chris Narveson’s double play. Catcher Jonathan Lucroy, who initially appeared to score on the play for a 3-0 Brewers lead, was ordered back to third base while Macha rushed out to argue. That call was crucial until the fifth inning, when McGehee’s two-run single off St. Louis starter Kyle Lohse (2-7) snapped a tie and gave the Brewers a 4-2 lead. McGehee also hit an RBI double in Milwaukee’s two-run first inning, and he claimed the club lead with 90 RBIs. That cushion was enough for Narveson (11-7), who matched a season-high with nine strikeouts and limited St. Louis to two runs on four hits in seven sharp innings. He didn’t allow a hit until the fourth inning, when the Cardinals strung together four in a row, including RBI singles by Yadier Molina and Colby Rasmus. Narveson watched a 1-0 lead slip away from the bullpen in the seventh inning of his previous start in Cincinnati, so this time he handled the inning himself. Narveson retired nine of the final 10 men he faced, and erased the exception — Matt Holliday, who walked leading off the sixth inning — on a strikeout-throwout double play. He set down the final five Cardinals hitters he faced in order, including three strikeouts. The 33,149 fans in the stands — or at least the 33,148 who avoided Davidson’s ire — might remember the flurry of ejections as much as McGehee’s clutch hit or Narveson’s mound gem. One inning after Macha was tossed by Timmons after the call at second base, Cardinals pitching coach Duncan was ejected in the bottom of the third inning for arguing balls and strikes for Lohse, who was charged with four runs on seven hits in five innings. Dickerson was ejected after striking out for the third time to end the fifth inning. Dickerson, who was upset in the first inning after his apparent ball four turned into a check-swing strike, took issue with Davidson’s called strike 3 to end the fifth and slammed his helmet. Two innings later, Davidson turned his attention to a male fan sitting in one of the front rows behind home plate. Davidson alerted security officials to the man, who was removed. MILWAUKEE — Sometimes in baseball, one inning is all it takes to change a game. For the Pirates on Friday, that inning was the bottom of the seventh. Entering the inning, they held a one-run lead over the Brewers and looked for starter James McDonald to deliver one final solid inning before handing it over to the bullpen. When the inning came to a close, the Pirates trailed by five runs — as they lost the series opener, 7-2, at Miller Park. Within that seventh inning, the turning point came with two on and one out, as rookie shortstop Alcides Escobar drove a 1-1 fastball over the head of right fielder Lastings Milledge for a two-run, game-winning triple. Off the bat, it looked like a routine line out to right field. As it reached Milledge, it was anything but. Following Milledge’s misplay on the Escobar triple, the Brewers tacked on four more runs on a pair of singles and two doubles, sending 12 batters to the plate before the Pirates finally got out of the inning. While an out on Escobar’s triple could have saved the game for the Pirates, things really got out of hand when starter James McDonald and reliever Chris Resop were unable to close out the inning over the next five batters. Milwaukee’s six-run, six-hit rally in the seventh inning marred what had been a spectacular performance by McDonald. Through five innings, the right-hander had allowed just one hit — a bunt single by Escobar — with zero walks and six strikeouts. In the sixth, McDonald made a big pitch to left fielder Ryan Braun to induce an inning-ending double play. But in the seventh, Braun managed to put the exclamation point on the Brewers’ victory. McDonald finished with 6 1/3 innings pitched, surrendering six runs on seven hits with seven strikeouts and a pair of walks. The outing was McDonald’s second-longest this season — but it was also his worst in terms of runs allowed. Before the game, Russell talked about focusing on the preparation and process, while ignoring the result. When asked about his start afterward, McDonald seemed to be following that mentality. Through five innings, though, things were falling the Pirates’ way. Milledge got things started in the second, leading off with a double and coming around to score two batters later on an RBI single by Ronny Cedeno. In the fifth, catcher Chris Snyder added another run with a one-out solo homer off Brewers starter Chris Narveson. But while Narveson (10-7) was not as sharp as McDonald through the first five innings, he benefited from the Brewers’ big seventh inning, picking up his first win since Aug. 3 and matching his second-longest outing of the season — going seven strong while allowing just two runs on seven hits with eight strikeouts. It looked through five innings like the Pirates would finally snap yet another double-digit road losing skid. Instead, the streak climbs to 11 straight losses away from PNC Park. For Milledge, though, the way the team has played in the last week far outweighs the Pirates’ 11-game road losing streak. CHICAGO — A change in approach may have led to the reversal of fortunes for the Brewers over the first two games this week against the Cubs. “Base hits up the middle,” said Brewers manager Ken Macha. “I think all the base hits were up the middle that we scored the four runs. They didn’t have as many hits to show for it as the previous night, but the Brewers continued to swing hot bats in Tuesday’s 4-3 win against the Cubs at Wrigley Field which clinched the series victory. Most importantly, the Crew delivered with runners in scoring position, going 3-for-7 in such situations. Milwaukee’s fourth and fifth hitters, Prince Fielder and Casey McGehee, combined to go 3-for-6 with three RBIs. The biggest hit of the night, though, belonged to the Brewers’ starting pitcher. With his hit in the fourth, lefty Chris Narveson put the Brewers up, 3-1, as he delivered a one-out single to center field that scored catcher Jonathan Lucroy from second base. Narveson (9-7) wasn’t as sharp as he might have liked, but like the Brewers’ offense, he came up big in big situations. The lefty went 5 2/3 innings, limiting the Cubs to just one run on six hits while walking one and recording six strikeouts. Rather than score their runs in bunches as they did Monday with five runs in each of the fourth and fifth innings, the Brewers strung together hits to score one run in the first, third, fourth and seventh innings. “We kind of scrapped for our runs tonight,” Macha said. During the Brewers’ previous series in Houston, Macha expressed concern about the team’s hitting approach in back-to-back shutout losses. That prompted him to discuss the matter with hitting coach Dale Sveum. Based on the early results, Milwaukee’s change in approach seems to have worked. Still, Sveum downplayed the idea of an up-the-middle-specific focus. McGehee agreed with Sveum, while noting the much-improved results of late. “It’s not like we sat down and all decided, ‘We’re going to stay in the middle of the field,'” McGehee said. “But Dale and I talked in the cage about what pitches we’ve been swinging at. It’s something that I’ve been trying to take up to the plate with me, but I don’t know what the other guys have been thinking. While four runs on nine hits doesn’t exactly compare to the 18 runs on 26 hits Milwaukee posted Monday, the Brewers scored at least four runs in consecutive games for the first time since doing so in three straight in a sweep of the Nationals from July 23-25. For the second straight night, Ryan Braun, Fielder and McGehee came up big for the Crew. In the first, Fielder and McGehee delivered back-to-back two-out singles, with McGehee’s scoring Braun and putting the Brewers on top early. Two innings later, Fielder’s one-out single scored Rickie Weeks from second, making it 2-1 in the Brewers’ favor. Finally, in the seventh, McGehee drove a liner to center for a sacrifice fly, scoring Weeks from third for the eventual game-winning run. Had it not been for a spectacular catch by All-Star center fielder Marlon Byrd, McGehee may have broken the game open with a one-out, bases-loaded hit. Though the Brewers came out on top, Diamond was impressive. Despite giving up seven hits in six innings, he struck out 10 batters, becoming the first Cubs pitcher to do so in his Major League debut since Mark Prior on May 22, 2002. Diamond (0-1) struck out three in the first — while also giving up a run on two hits and a walk — and added at least one strikeout in every inning but the fifth.